Read the interview on New Myths. For generations, the tribe has gathered at Midwinter to observe the sacred battle between the Oak and the Holly and to pray for the world’s renewal. This year, Darak witnesses strange portents in the night sky that bode ill for the tribe and for his brother. His worst fears are realized when Chaos intrudes on the grove of the First Forest, casting Tinneans spirit adrift along with the Tree-Lords. His world locked in winter, Darak must fulfill his role as the tribe’s hunter and seek out and restore the lost spirits, even if the journey takes him into the heart of Chaos. 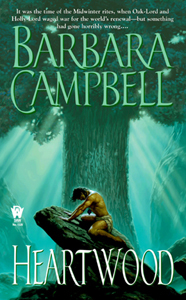 "I stayed up way past any logical hour last night to finish reading Heartwood by Barbara Campbell. And got up far too early this morning to start the sequel. The world build(ing) was so enthralling that not only am I interested to see what all is going to happen, I am utterly fascinated with the different people Campbell has filled her world with. Heartwood was honestly the best book I have never heard of. Often beautiful, occasionally brutal, Heartwood was a unique fantasy. It’s a primitive, tribal setting, which had my attention within a handful of pages. The thing that needs saving is the very natural order of things, and damn, was it wonderfully well done. So, seeing as I went through years in the book business never hearing about this treasure of a book, I wanted to take a few minutes to make sure (the) word goes out. They are hard to find in bookstores proper, as they are a few years old, but take the time to go online and get copies. You won't regret it.” Read the whole post on Live Journal. Fifteen years have passed since Darak’s quest. His son is now apprenticed to the village’s Tree-Father. Keirith unwittingly commits sacrilege by using his gift to commune with other creatures, the crime for which the evil shaman Morgath was destroyed. But a more immediate danger threatens the people of the Oak and Holly: the burgeoning power of the ancient enemy who drove them from their ancestral lands. When Keirith is kidnapped, Darak sets off in pursuit. Their paths take them to the heart of a distant city where both father and son must confront their darkest fears in order to survive. "When I started reading this book, I got caught up in it immediately, and that hasn't happened to me with a fantasy novel for quite a while. I was instantly engaged with Keirith and his plight. 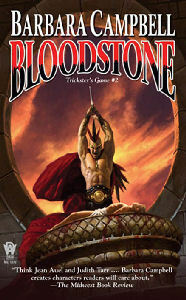 Bloodstone is an excellent novel, one that I highly recommend everyone find and read, especially if you're looking for something without the medieval setting. It's a spectacular fantasy, with characters that come alive, with problems that have no easy solution, even with magic at hand." Read the whole review. On the bleak northern moors, Darak and his family begin a new life, free from the prejudices of their tribe and the looming threat of the Zherosi. But their past continues to haunt them, and choices made years ago threaten their future as surely as the armies that raze their forests. As rebellion spreads and the tribes fight for survival, a new force enters the game - Rigat, the youngest son of Darak and Griane. Gifted with magic far greater than Keirith’s, Rigat is the only one who might be able to save his people. Aided by the Trickster, he embarks on a dangerous game of deception that will determine the future of the children of the Oak and Holly - and the fate of the gods they worship. "Some series expire when they run out of ideas. Foxfire brings its series to a wonderful conclusion that left this reader marveling at Barbara Campbell's inventiveness." "WOW! What an ending to a fantastic trilogy! Campbell's characterization and plotting continues to astound. She had me cursing then rooting for almost every character in this very exciting conclusion. Darak and Griane do all in their power to save their son Rigat from himself. Do they succeed? Get the book to find out, cause I ain't tellin'! 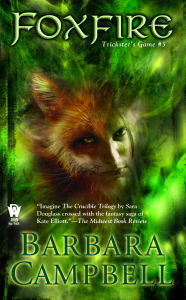 One thing I will say: Foxfire is worth more than the cover price. I read it in less than five days and was up till the wee hours several nights during a work week." Read the interview with John Joseph Adams on tor.com. Check out my latest novels.